A beautiful and rare chart consisting of two engraved drawings within a single border. Left hand drawing, entitled 'A Circle of Winds consisting of 32 points commonly called the Mariners Compass,' shows exactly that – a compass rose consisting of 32 points and decorated with images of ship and cherubs using nautical equipment. The right hand drawing, entitled 'The Artificial Sphere,' features an Armillary Sphere and more navigating cherubs. An extremely attractive engraving. Prepared by Emanuel Bowen as plate no. 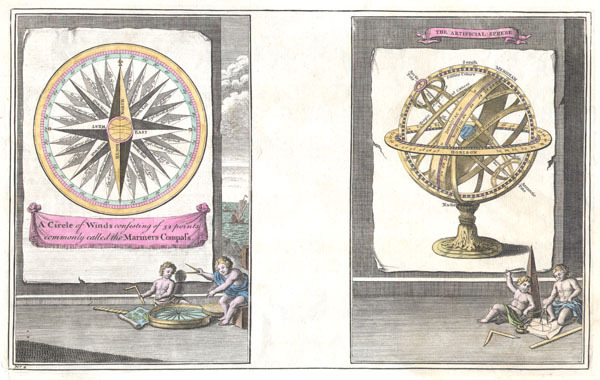 2 for the 1747 issue of Herman Moll's Complete System of Geography. Very good condition. Minor margin repair in lower left corner. Else clean. Rumsey 3733.002. P614 (1752 edition of A Complete Atlas...). NMM p.356. M&B p 166.